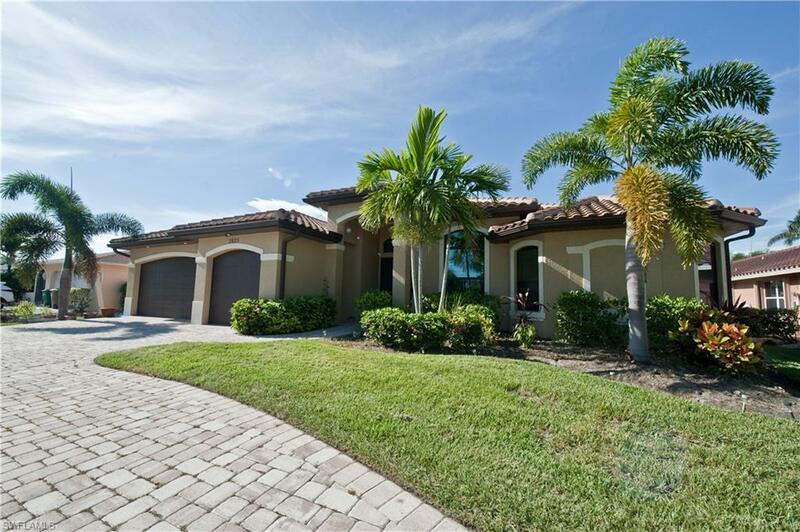 2825 SW 51st St, Cape Coral, FL.| MLS# 218054436 | Southwest Florida Residential Real Estate for Sale. PRICE REDUCTION! HAPPY HOLIDAYS - time to act fast because this custom built 2015, ~ 2500 sq ft, 4 bedrooms PLUS a den, 3 car garage & 3 bathroom home is almost new without the price! The functional layout offers excellent quarters for guests or in-laws and leaves you with plenty of office space. Features include: Hurricane impact windows, open floor plan, large gourmet kitchen with island, wood cabinet, granite counter tops, gorgeous bathrooms, recessed lighting, tile floors, fully fenced oversized yard, and an incredible outdoor space are only a few of the top features! You will love hanging out in your heated pool in the large, fully screened lanai which offers plenty of sunbathing space as well as space to lounge in the shade. This home also offers a modern and inviting stone wall fireplace! The substantial 17' x 10' Master bath offers dual vanities and a gorgeous shower. If you are looking for "a wow house", nestled among other beauties, this is your next home! Make your appointment to see it today!